This week’s episode of Survivor: Redemption Island begins with the final duel to determine who will return to the game. After being voted off last week, Sarita faces off against Matt in a challenge that tests their will to withstand pain while standing on wood foot holds that decrease in size. With both tribes watching, Matt outlasts Sarita and is given the chance to rejoin the game. 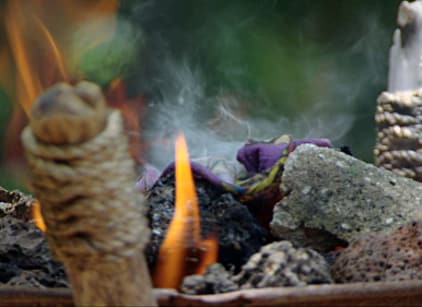 The remaining survivors also learn that the tribes are merging in to one and another round of Redemption Island will begin after the next Tribal Council. The newly merged tribe makes their way to a new camp and Boston Rob immediately suggests the tribe name of Murlonio claiming that it’s a Spanish word for joined from the sea. The new tribe loves the name, but do not realize that Boston Rob made the name up for his own enjoyment and that it has no Spanish meaning. Meanwhile, back in the game for the first time since the beginning, Matt takes the opportunity to reconnect with his old friend, Andrea. The pair plots a plan to blindside Rob after initially voting out Mike and then Philip. While Matt is confident in the plan, Andrea is a bit skeptical of Matt’s motives and the idea of stirring the pot so soon. Similarly, Mike wastes no time trying to be a bug in Matt’s ear about flipping sides. With tribal immunity out of the way, the remaining survivors compete in their first individual immunity challenge. The twelve remaining castaways had to balance on a log while holding a flat disc with a ball on it. Two additional balls would be added at fifteen minute intervals until there were three in total. While a few struggled with one and two balls, once the third ball was introduced the group was quickly whittled down to Natalie and Mike. Neither lost a ball, but Mike fell off the log first, giving Natalie immunity. After the challenge, Matt professes his allegiance to Boston Rob and the former Ometepes, but then makes the mistake of revealing his and Andrea’s plotting to get rid of Rob. Instead of building trust, Matt’s honestly only strengthens Rob’s resolve that Matt is a threat and needs to be voted out. By mentioning Andrea’s part in the plotting, he alienates her allegiance to him and she reluctantly is on board with voting Matt out. Prior to tribal council, Matt senses that something is off with his tribe and Mike tries to take advantage of this uncertainty. Although the entire tribe is around building the new camp making it hard for Mike to get a moment with Matt, Mike writes a note to Matt and hands it to him. The note instructs Matt to vote for Grant and he’d be rewarded with a trip to the final three. Despite Mike’s promise, Matt feels as if God’s choice is for him to stay with the Ometepes. Unfortunately for Matt, they don’t feel the same and send him back to Redemption Island in a surprising vote.